Landlord-Tenant claims, will you accept them? Contact your local small claims court to find out what paperwork you will need to file a law suit against the tenant/debtor. Inquire about the filing fee and be sure that you are filing in the right county based on where the tenant/debtor now resides. Each court has a maximum dollar amount for small claims cases. Be sure to inquire about that amount. If you have evicted the tenant/debtor you may already have a money judgment against the debtor so be sure to review the documents from the eviction prior to filing another action. Contacting an attorney for assistance/direction is always advisable. Ten minutes with an attorney could save you a lot of money and time if you are unsure about court process. 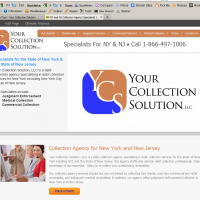 Once you have a judgment Your Collection Solution, LLC will work to collect the judgment on your behalf. Ways that you can help us collect your judgment against an individual. Handshake or a Written Contract? Is my judgment too old to collect?